More than 170,000 elementary and high school students participated in the Student Vote program for the 2017 B.C. provincial election, including students from King David High School and Richmond Jewish Day School. After learning about the electoral process, researching the parties and platforms, and debating the future of British Columbia, students cast ballots for the official candidates running in their local electoral district. As of 4:15 p.m. on election day, May 9, 1,092 schools had reported their election results, representing all 87 electoral districts in the province. In total, 170,238 ballots were cast by student participants; 163,923 valid votes and 6,315 rejected votes. Students elected John Horgan and the B.C. NDP to form government with 60 out of 87 seats and 39.0% of the vote. Horgan won in his electoral district of Langford-Juan de Fuca with 55.7% of the vote. Andrew Weaver and the B.C. Greens took 14 seats and would form the official opposition, receiving 28.5% of the popular vote. Weaver won in his electoral district of Oak Bay-Gordon Head with 48.9% of the vote. Christy Clark and the B.C. Liberals won 12 seats and received 25.4% of the vote. She was defeated in her district of Kelowna West by NDP candidate Shelley Cook; Clark receiving 32.1% of votes cast, compared to Cook’s 35.8%. Students also elected independent candidate Nicholas Wong in Delta South. Wong defeated Liberal candidate Ian Paton by 10 votes. This is the fourth provincial-level Student Vote project conducted in British Columbia. In the 2013 provincial election, 101,627 students participated from 766 schools. Student Vote is the flagship program of CIVIX, a national civic education charity. 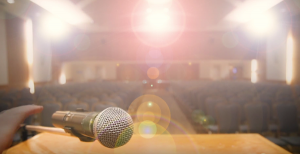 CIVIX provides learning opportunities to help young Canadians practise their rights and responsibilities as citizens and connect with their democratic institutions. Its programming focuses on the themes of elections, government budgets and elected representatives. 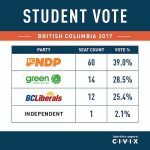 The Student Vote project for the 2017 B.C. provincial election was conducted in partnership with Elections BC and with support from the Vancouver Foundation, the B.C. Teachers’ Federation and the Government of Canada.